So I heard it was in the 90s on the East Coast of the US this past Memorial Day weekend.... Seattle on the other hand struggled to hit 60F. It was dang COLD! But I still used the weekend to do some planting and prep my yard for spending warm days out there working. I'm an optimist at heart. I'm sure everyone has heard, but Anthro brought back free shipping until July 15th if you have an Anthro card. WOOHOO!!! Get your orders in now lovelies! This dress hit sale last week! I grabbed it on the way to the dressing room. The size 0 was waaaaaay too small. I couldn't zip the bodice up over my huge rib cage :) My guess is that I'd need a 4 for this to fit well. I loved the beautiful print mixes in this piece (3 prints for the price of 1 LOL - or four prints if you count the pretty rope belt). The navy colors are a soothing take on the ethnic print dresses that we've been seeing. The material was surprisingly weighty in a wonderful rich kind of way. I didn't realize until I looked this bugger up on the website that it is actually billed as a strapless dress. I love that the removable straps are not an after thought here. They're beautiful thick straps (great for hiding bra straps) in a matching patterned fabric. The straps are held on by buttons on the inside of the dress. The dress I brought into the dressing room with me was missing a button in back so I'm actually holding the strap up just for y'all. And BTW y'all, there's pockets!!!! SQUEEEEE! why do i look like I think someone is about to mug me? ha. now that's embarrassing. I'm showing you my rear. All in the name of full disclosure, but like to know how pants fit me in back. These aren't hugely flattering in back (much cuter and shapely in front). The size 2 fit perfectly here. While pleats in shorts aren't the first thing that come to mind for good fit (I usually think of pleated shorts as kind of ballooning out around the thigh area), these pleats (or perhaps darts is more accurate) help the front lay wonderfully flat and elegantly. The fit is also helped by the fact that the closure isn't in front. You fasten the shorts on the side with five round metal buttons whose shape is reminiscent of the dot pattern covering the rest of the shorts. The silk felt wonderfully light and airy on. But both the silky material and bold print make these an unlikely purchase for me. I rarely wear shorts unless I'm slumming it laying out on the deck reading for my dissertation. I wouldn't rub silk up against the rough wood of my deck. The bold color and pattern is great for a dress, but I'm not sure I would wear it as often when it's on a pair of shorts. Still, it's a beautiful pair of shorts that will look great on many folks. Thanks for the review on the shorts. I keep meaning to try them but it just doesn't seem like shorts weather yet! They look cute on, but I'm waiting for sale with that price. I ordered a Magellan Dress last week and am still waiting, but it looks great! I think the shorts look so adorable on you Lori. It looks great with the striped red top and jewels. Hmm...at least the weather in seattle sounds better than what we have in Sydney now! Oh those shorts are just too, too cute on you! I don't wear shorts much, and that's just about the only thing preventing me from splurging on both these and the Gerbera shorts. ahhh the shorts are sooo cute with those buttons and the polka dots!! love them! The silk does look airy and comfy, so cute! thanks for the reviews! 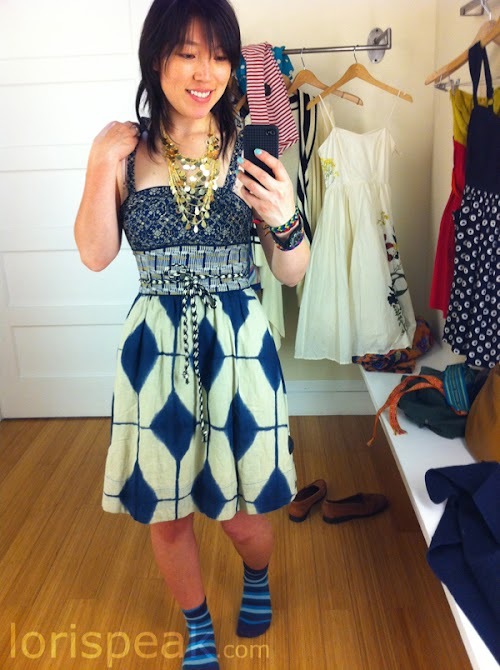 I really liked the Magellan dress and was bummed when it sold out. I'll keep looking for a pop back. The dotty shorts look great with your socks! It's like unintentional pattern mixing! I think both the dress and the shorts look great on you! You must have missed my suggestion to size up for the Magellan 2 months ago. At least you are in the store and can grab the right size. Ha-ha! I know how you love pockets Lori. Silly me! I returned the Magellan after I reviewed it, and decided to wait for sale. I ordered it a few weeks later because there were only a few left in size 4. That's right! I forgot my own suggestion to size up. There actually were plenty of size 6's online. I was looking at size 4's and panicking. So I returned the second size 4 dress and ordered the dress a third time in size 6. When it arrived, I suddenly realized It wasn't a Laura dress after all. What a fiasco. I love those shorts Lori. Maybe they need to be sized up for a loose, relaxed fit. Regardless, I'm with you! I only wear shorts around the house. They must be cotton, stretchy and washable on a daily basis. And so comfy that ugly becomes a requirement. otherwise known as the House Shorts.